Dr. Ian Baldwin is a Professor in the Department of Molecular Ecology and Founding Director at the Max Planck Institute for Chemical Ecology. He received his PhD in Chemical Ecology in the Section of Neurobiology and Behavior from Cornell University. He served on the faculty at SUNY, Buffalo for about eight years before accepting a position as the Max Planck Institute for Chemical Ecology where he remains today. Ian has received many awards and honors during his career, including the Presidential Young Investigator Award, the Silverstein-Simeone Award of the International Society of Chemical Ecology, and being named an Extraordinary member of the Berlin-Brandenburg Academy of Sciences and Humanities. He is also an elected member of the National Academy of Sciences, the German Academy of Sciences Leopoldina, and the European Molecular Biology Organization. Ian is here with us today to tell us all about his journey through life and science. Ian is an avid birdwatcher, and he is particularly fond of Accipiters (a type of hawk) and humming birds. One of Ian’s goals is to get a better understanding of how genes work. To know what a gene is doing in an organism, you have to take a whole organismic perspective and determine how it contributes to fitness and evolution. He does this by creating transgenic versions of a model plant species and finding out what the gene does in the real world by seeing how the modified plants survive in the wild. Working as an automechanic during high school and college helped Ian become well-versed in the art of hypothesis testing. A car would come in broken, and he would have to generate and tests different hypotheses to figure out what was wrong to fix the car. He thought learning about how nature works was more exciting than fixing a lot of the same problems in cars, and this led him to a career in biology. Ian had great success early in his career, and his work on plants detecting distress signals from other plants was picked up by the media. Details of his research were misconstrued, and it quickly turned into a lot of press on “talking trees”, even though he didn’t mean to suggest plants were intentionally communicating. This lead to some unhappy scientists and unpleasant science politics that made it impossible for him to get a grant on these projects for the next 10 years. Despite difficulties continuing his inter-plant signaling research, Ian was able to turn things around and be particularly successful asking new questions about how communication works within a plant. He has made great progress creating transgenic plants that cannot send or receive signals to really understand the importance of this signaling and what happens in the wild without it. For four months of the year, Ian can be found at a beautifully scenic field station in Utah. He has been going there for about 20 years now! Ian feels like he has a really deep relationship with this place because he has spent so much time there and has watched it change over the years. Utah is definitely a trek from his home in Germany and the trip is rough on the biological clock, but for him it’s worth it! One tradition in Ian’s lab is that everyone has a white board outside their office where they have to write their current working hypothesis and it’s falsification. To Ian, developing hypotheses and testing them is the only skill that you will learn as a scientist that will never become obsolete. Being a scientist is about becoming a knowledge addict and falling in love with a project. Ian has published more than 370 peer-reviewed papers and one book on the induced defenses of plants. He is distinguished by having integrated the advances in molecular biology into the study of ecological interactions to catalyze a change in how ecologists examine ecological interactions and falsify hypotheses and by having integrated the whole-organismic expertise of ecologists into the study of gene function. In his Department he is training the next generation of whole-organismic biologists (genome-enabled field biologists). 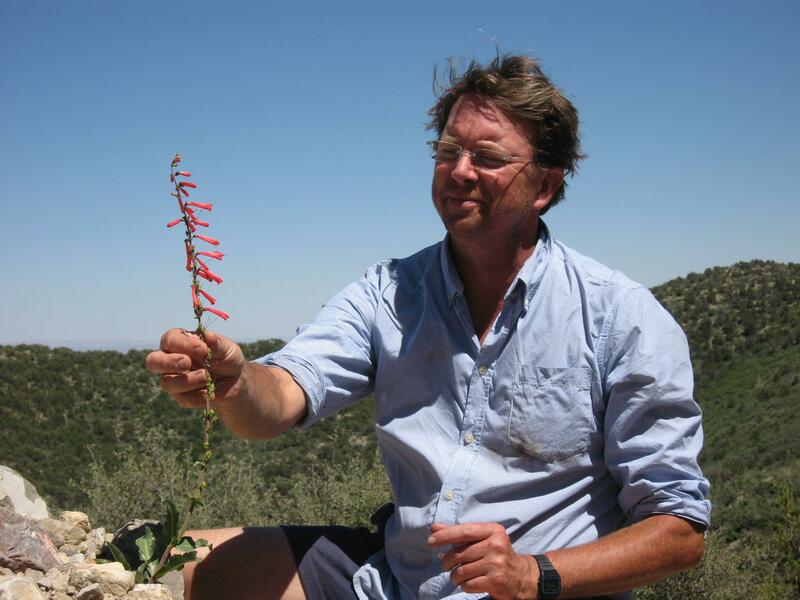 In this research program, Baldwin and his students regularly use a nature preserve in the Great Basin Desert of the US to conduct experiments with genetically modified plants in the plant’s native environment to understand the genes that matter for survival under real world conditions. The research program has uncovered mechanisms by which plants resist and tolerate attack from herbivores and pathogens and optimize pollination services.